The first domino of the 2017 trade deadline fell yesterday, as the Cubs swung a deal with their crosstown rivals for Jose Quintana. Quintana has been one of the best pitchers in baseball the past few years, so he understandably brought back a substantial prospect haul. The Cubs coughed up top prospects Eloy Jimenez and Dylan Cease in the deal. Both are possess enticing upside, but neither has put up dominant numbers in the low minors. As a result, KATOH is relatively low on both. A couple of lower-tier prospects, Matt Rose and Bryant Flete, were also included in the deal. Below are the projections for the four players whom the White Sox receive. WAR figures account for the player’s first six major-league seasons. KATOH denotes the stats-only version of the projection system, while KATOH+ denotes the methodology that includes a player’s prospect rankings. Jimenez is undoubtedly the centerpiece in this deal. The 20-year-old Dominican left fielder ranked fifth and eighth on Baseball America’s and Baseball Prospectus’s lists, respectively. After missing the season’s first few weeks with a shoulder injury, Jimenez has hit .271/.351/.490 at High-A. He hit a loud .329/.369/.532 in Low-A last season. Over the winter, Eric Longenhagen praised Jimenez’s power potential, ranking him No. 15 on his preseason top-100 list. He’s got 70 raw power right now, flicking lasers over the left-field wall with ease during BP and stumbling into wall-scraping homers he barely squares up in games. I think he’s going to have elite power in his mid-20s and there’s solid feel for contact here, too. My KATOH system is a tad skeptical of Jimenez due to his near-complete lack of defensive value and 20% strikeout rate in A-ball. Still, it sees a good deal of promise in his power and youth. For someone Jimenez’s age, 24 homers in 154 games at A-ball is impressive, regardless of what position he plays. To put some faces to Jimenez’s statistical profile, let’s generate some statistical comps. I calculated a Mahalanobis distance between Jimenez’s A-ball performance and every season since 1991. In the table below, you’ll find the 10 most similar seasons, ranked from most to least similar. The WAR totals refer to each player’s first six seasons in the major leagues. A lower “Mah Dist” reading indicates a closer comp. While not as highly regarded as Jimenez, Cease has also turned up on top-100 lists, with Baseball America ranking him 83rd this month. Cease has struck out an exciting 35% of Low-A hitters this year but has also walked 12%. He performed similarly each of the past two years in short-season ball. 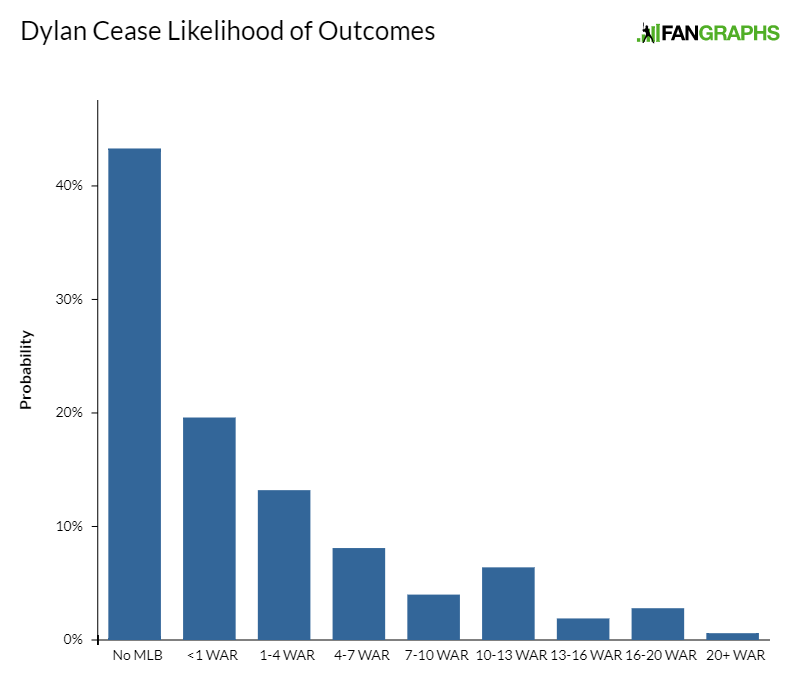 Eric Longenhagen gave his fastball a 70 grade and his command a 30 over the winter (with a 45 future grade), which explains how one winds up with numbers like Cease’s. KATOH is relatively low on Cease, placing him in the No. 150-200 range. KATOH is normally a sucker for high-strikeout pitchers, but there are some red flags with Cease. In addition to his high walk rates, Cease isn’t particularly young for his level as a 21-year-old high-school draftee at Low-A. Despite being drafted three years ago, Cease has a serious walk problem and is completely unproven in the upper levels. Rose has shown some pop this year, hitting 14 homers in 65 High-A games. That’s about all he can do, though, as he also has a .281 OBP and a 25% strikeout rate. 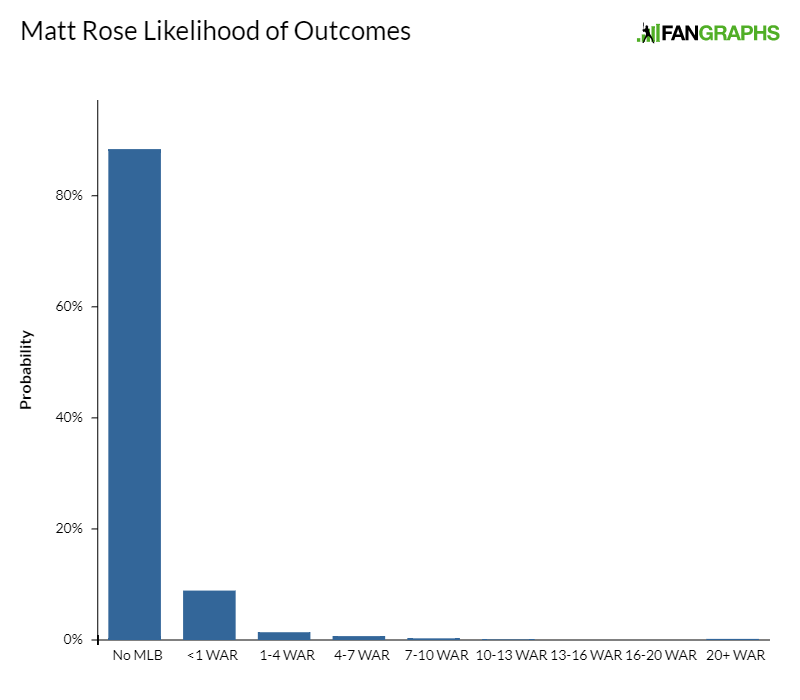 As a soon-to-be-23-year-old first baseman scuffling in A-ball, Rose has a long way to go. Rose has power and appears to be a good defensive first baseman, but isn’t much of a prospect. 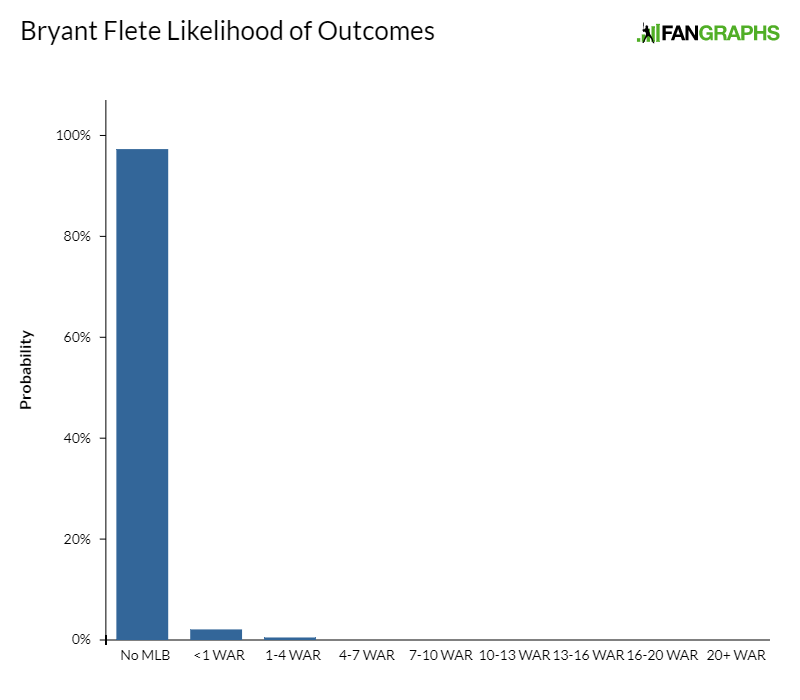 Flete has hit a solid .305/.355/.425, but has undeniably been helped by a .358 BABIP. He’s also a 24-year-old, 5-foot-10 second baseman with defensive numbers that suggest he doesn’t belong there. There isn’t much to like beyond his 2017 slash line. He looks like a longshot even to crack the big leagues, but stranger things have happened. We hoped you liked reading Projecting the Prospects in the Jose Quintana Trade by Chris Mitchell! Where Is Mike Trout Going to Finish? As someone without a stake in either team, my main takeaway from this was: holy —- Delmon Young would have been projected for over 20 WAR by KATOH? What the heck happened to that guy? BP just wrote this for shiggles article about the top 50 prospect busts. Delmon Young is #3. Delmon’s player page has -1.8 Career WAR listed, not 2.7. Why the discrepancy?